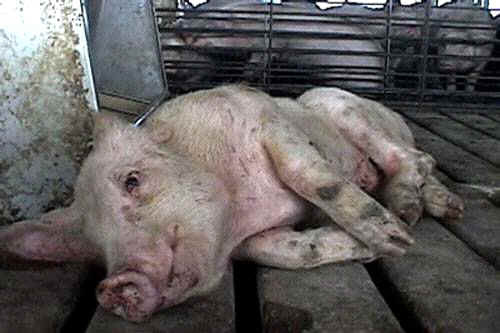 (Pig Exploitation - Factory Farming - 19-a) Unable to move or stand on her own, this pig has been left to die. Her gaunt body indicates that she is starving to death. When pigs who are unable to walk (called "downers") arrive at the slaughterhouse, they have no protection from the most unthinkable cruelty. These sick and injured animals will be kicked, shocked with electric prods, and finally dragged off the trucks to their deaths.